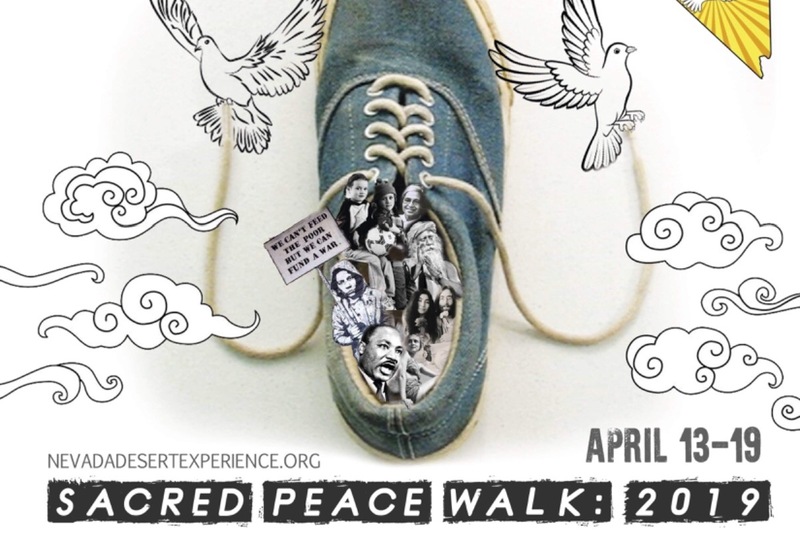 The Sacred Peace Walk is a pilgrimage from Las Vegas Nevada to the Nevada Test Site, home of Yucca Mountain. The walk stakes place over the course of one week with four days of walking (approximately 15 miles each day) and two days of prayer, contemplation, and direct action. This journey carries the significance of peace through the city of Las Vegas, past Creech Air Force Base, and to the Nevada Test Site. Ever while contemplating the necessity to put focus on the pain that exists in the world and our connection to it, so to bring the beauty of the world to the front of our intentions and vision. We walk alongside the Western Shoshone Nation who share this vision. The Western Shoshone Nation are the owners of the land the Nevada Test Site was built on by the Department of Energy. Though the violence and poverty in Las Vegas and the perpetual killing from DroneWarfare at Creech Air force base are present and very alarming situations, there is a growing urgency to begin communicating about the Nevada Test Site as Yucca mountain is turned into a waste dump above Nevada water tables. A walk for peace is a prayer for something the world will benefit from and is something that all faiths are welcomed to join. The Sacred Peace Walk carries this prayer with each step, for a healthier future, happier lives, and the comfort of peace for every mind. To cover costs on this 60 mile pilgrimage for peace, we ask you to sponsor a walker by helping them pay for the expenses of their basic needs such as food, water, and physical needs.